Effective search and discovery needs to know what information that is relevant to you, your colleagues, the work you do and your context right now. 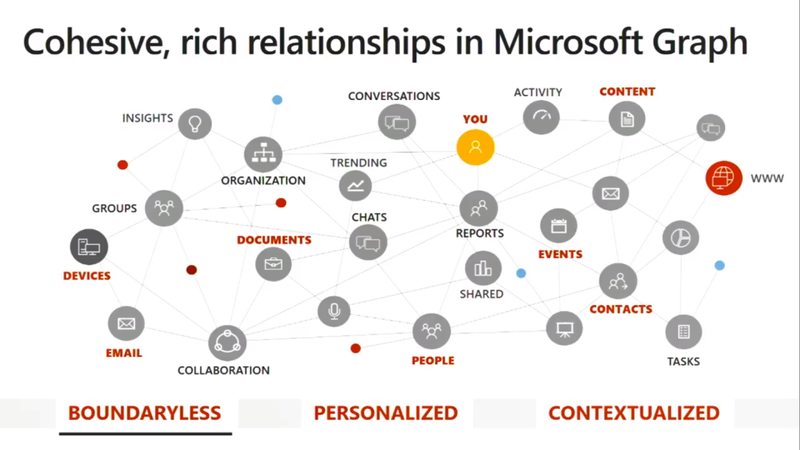 Find out how we have used insights across Microsoft 365 to create such a personalized search experience. A new search UX has been developed focusing on simplicity and performance enabling the user to quickly interact with a more personal and semantic organization of data. 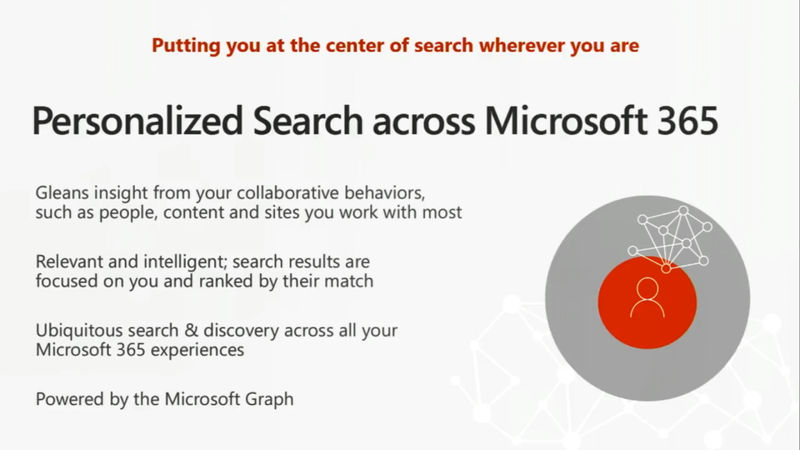 Find out how search now also supports multi-national corporations and all the improvements inside the Microsoft Graph. 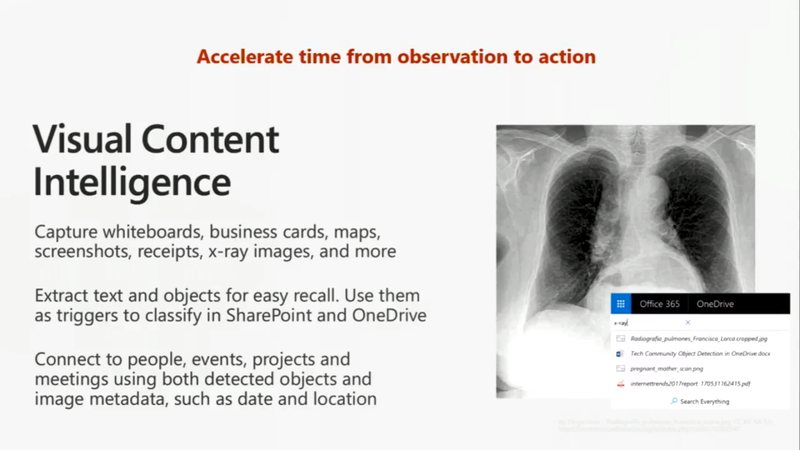 Also learn about the roadmap for enterprise search in SharePoint and Office 365 for new experiences, and the convergence of FAST and Bing search innovations. 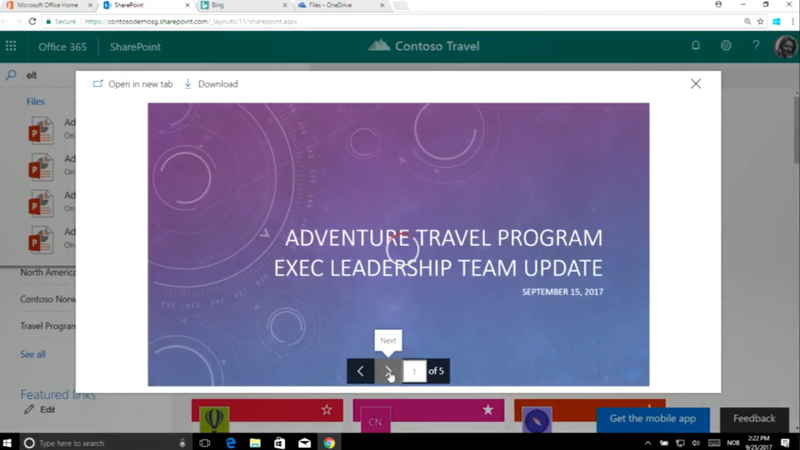 The presenter is advocating for using the SharePoint tile as your starting point for all of MS365. 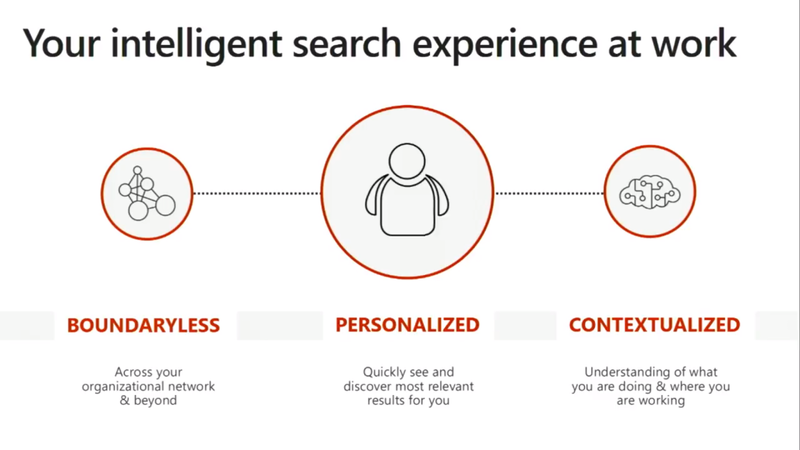 Search is being engineered with a lot of AI to “learn” how you use it and customize and fine tune your experience. 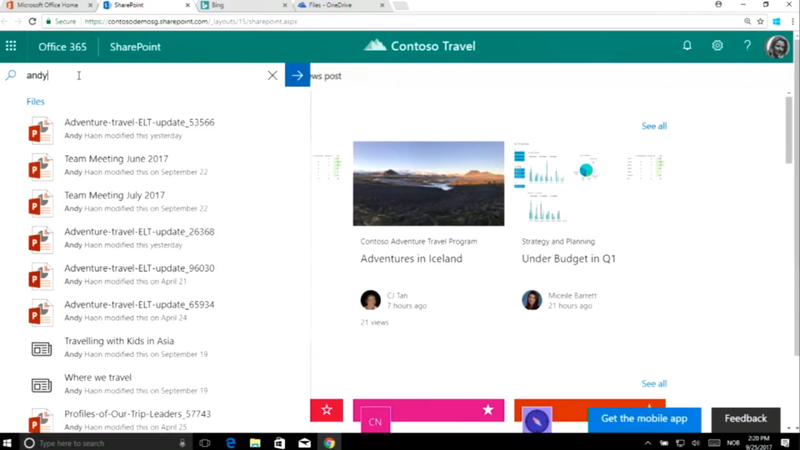 Searching for people will soon bring back results based not only on their AD information, but on the activities they’ve being doing inside of MS365 (documents updated, groups accessed, etc.). The use case was that you heard a colleague was working on a travel document that you wanted to look at, but you don’t know the title other than it probably contains the word “travel”. They demonstrated how it would found faster by searching on the colleague’s name rather than a generic search for “travel”. It came up as the first result for that person under files. 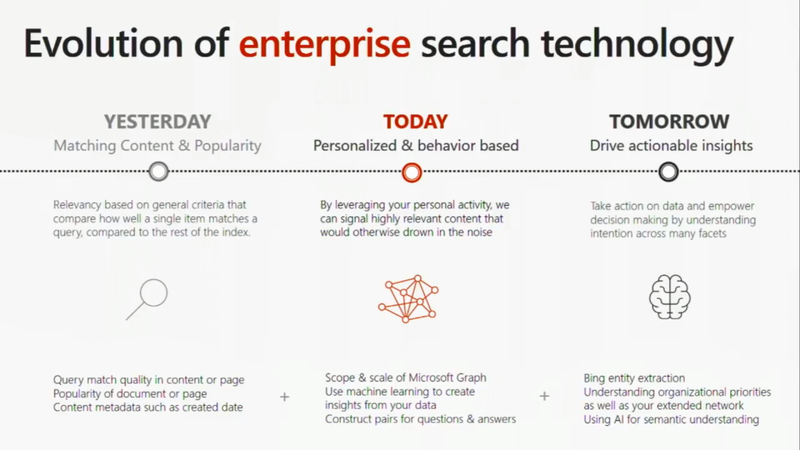 The search they are designing is an enterprise search only if we are able to drive the users work tasks into MS365. Then, all of that becomes discoverable–the enterprise becomes discoverable. The presenter is covering the difference between consumer search (Google, Yahoo, Bing) and enterprise search (where no one can find anything). So consumer search is all about popularity. Enterprise search may not be best if it’s based only on popularity, because corporate content isn’t exactly “popular”. 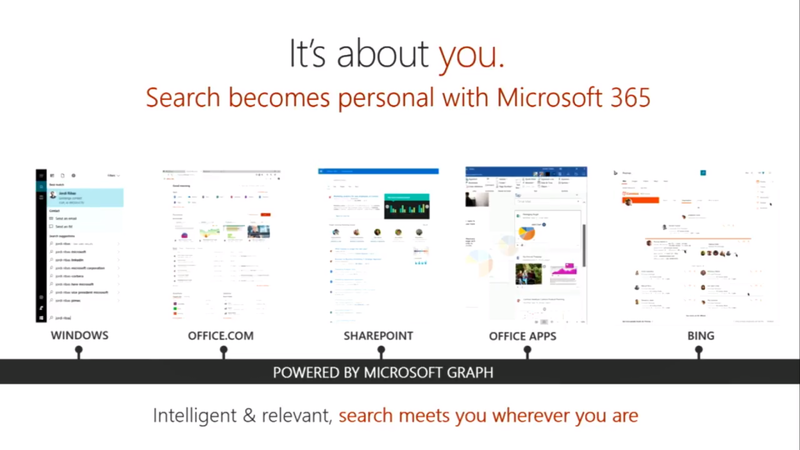 MS search is shifting from matching and popularity to \people and behavior. Also, scannability of search results is a focus. Other features being refined are search within and scoped (faceted) search. Rich people driven search results are sourced from Delve profiles. The more of the profile that is filled in, the richer the results. Visual Content Intelligence – indexing of special content (images specifically) by extracting text or context and making the data available via search. This will be an upcoming feature. This might be totally groovy for PDF drawings. The example they gave was of a scanned receipt that had “Ribeye” on it. The presenter recalled having a really great ribeye steak, but couldn’t remember the name of the restaurant. She searched on “ribeye” and found the receipt, which had the restaurant listed. Again, they are stressing the office.com experience. 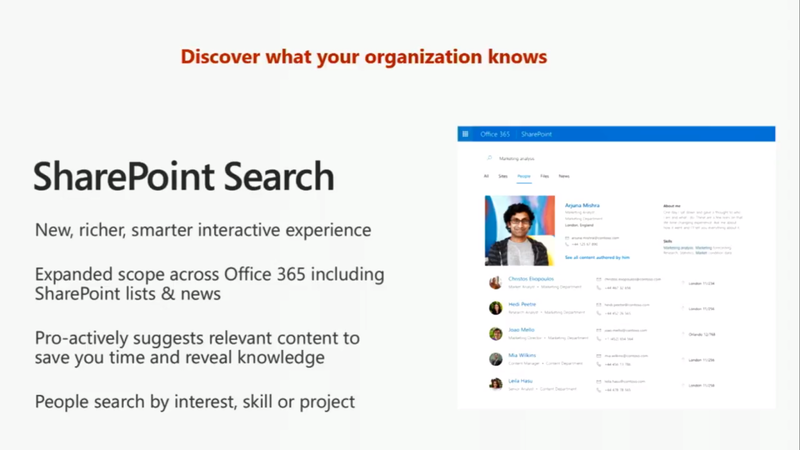 The new search features are available there as well as in the O365. Multi-GEO search is also a new feature that we’ll never use. It is important for companies that are global and have data residency regulations. But seriously, they are REALLY focusing on search. I still feel like search, especially enterprise search, is the killer app in this heaping pile of apps.